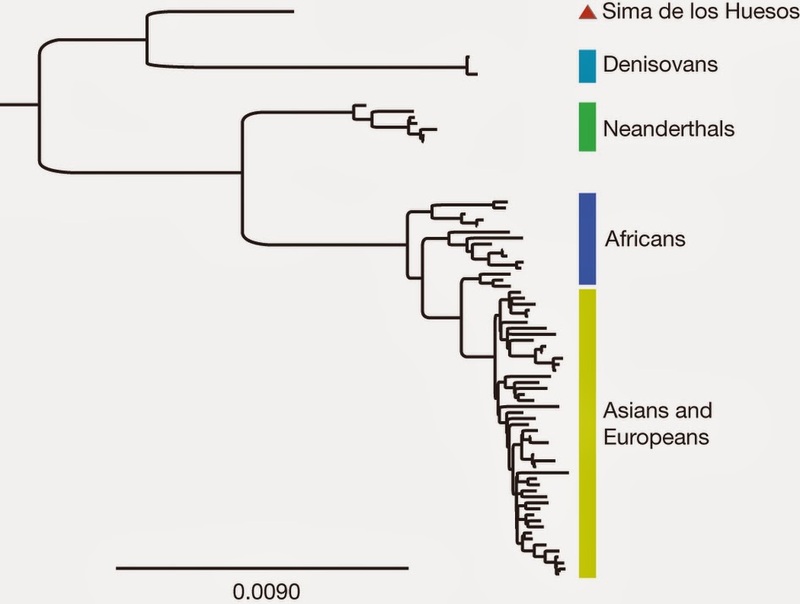 A quick note on two recent studies on the relevance of Neanderthal introgression on modern Humankind, notably the “out of Africa” branch. Genomic studies have shown that Neanderthals interbred with modern humans, and that non-Africans today are the products of this mixture1, 2. The antiquity of Neanderthal gene flow into modern humans means that genomic regions that derive from Neanderthals in any one human today are usually less than a hundred kilobases in size. 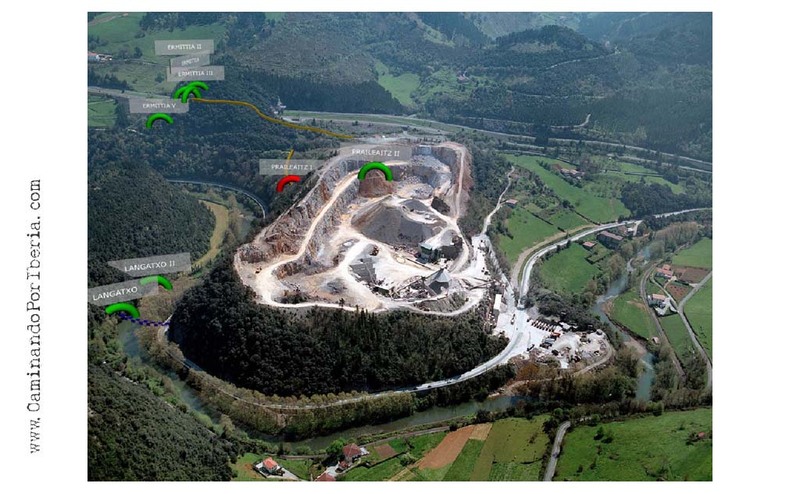 However, Neanderthal haplotypes are also distinctive enough that several studies have been able to detect Neanderthal ancestry at specific loci1, 3, 4, 5, 6, 7, 8. 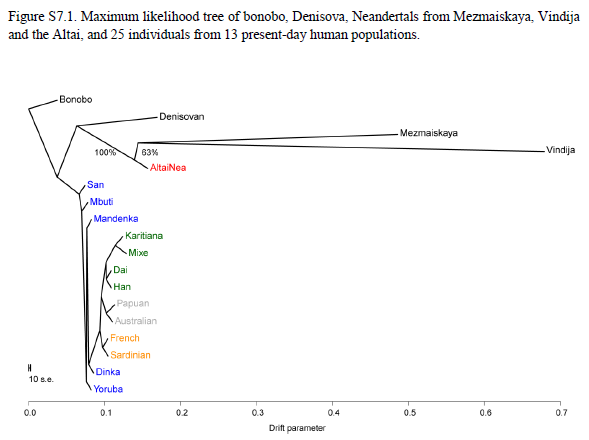 We systematically infer Neanderthal haplotypes in the genomes of 1,004 present-day humans9. Regions that harbour a high frequency of Neanderthal alleles are enriched for genes affecting keratin filaments, suggesting that Neanderthal alleles may have helped modern humans to adapt to non-African environments. We identify multiple Neanderthal-derived alleles that confer risk for disease, suggesting that Neanderthal alleles continue to shape human biology. An unexpected finding is that regions with reduced Neanderthal ancestry are enriched in genes, implying selection to remove genetic material derived from Neanderthals. Genes that are more highly expressed in testes than in any other tissue are especially reduced in Neanderthal ancestry, and there is an approximately fivefold reduction of Neanderthal ancestry on the X chromosome, which is known from studies of diverse species to be especially dense in male hybrid sterility genes10, 11, 12. 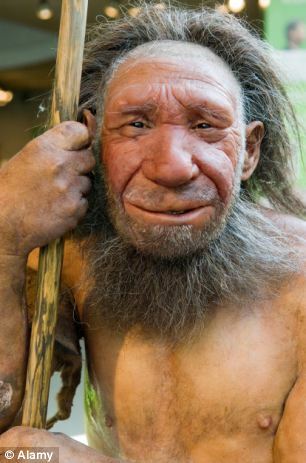 These results suggest that part of the explanation for genomic regions of reduced Neanderthal ancestry is Neanderthal alleles that caused decreased fertility in males when moved to a modern human genetic background. → Synthesis at Science Daily. 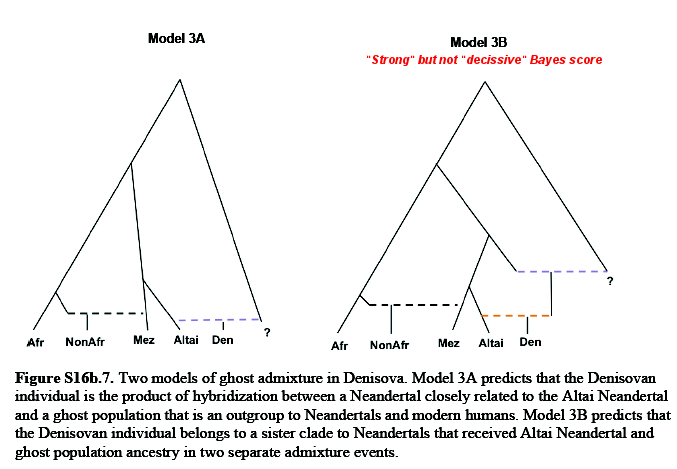 Anatomically modern humans overlapped and mated with Neandertals such that non-African humans inherit ~1-3% of their genomes from Neandertal ancestors. 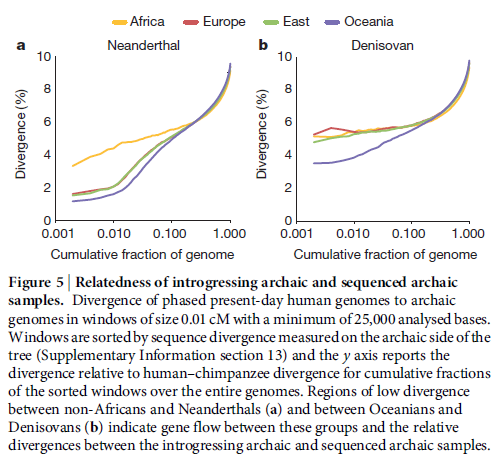 We identified Neandertal lineages that persist in the DNA of modern humans, in whole-genome sequences from 379 European and 286 East Asian individuals, recovering over 15 Gb of introgressed sequence that spans ~20% of the Neandertal genome (FDR = 5%). 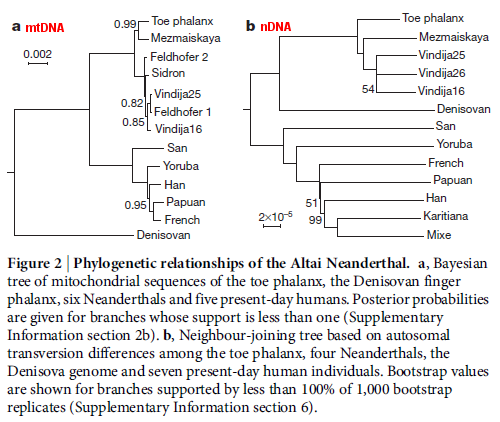 Analyses of surviving archaic lineages suggests that there were fitness costs to hybridization, admixture occurred both before and subsequent to divergence of non-African modern humans, and Neandertals were a source of adaptive variation for loci involved in skin phenotypes. Our results provide a new avenue for paleogenomics studies, allowing substantial amounts of population-level DNA sequence information to be obtained from extinct groups even in the absence of fossilized remains. I don’t have access to the papers (update: I do have the second one now) but, honestly, I don’t have time either, so, even with full access, I would have to be rather shallow, given the complexity of the matter. Areas of dense gene presence tend to be more depleted of Neanderthal inheritance, meaning that, at least in many cases Neanderthal genes were deleterious (harmful) in the context of the H. sapiens genome. 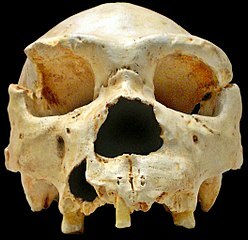 It’s probable that they worked better in their “native” context of the Neanderthal genome but we must not understimate the risks of low genetic diversity, a problem that affected Neanderthals as well as H. heidelbergensis (species probably including Denisovans or at least their non-Neanderthal ancestry). The areas of very low Neanderthal genetic influence include those of reproductive relevance, including genes affecting the testes and the chromosome X. This is typical of the hybrid infertility phenomenon, which is part of species divergence, making more difficult or even impossible that hybrids can reproduce. 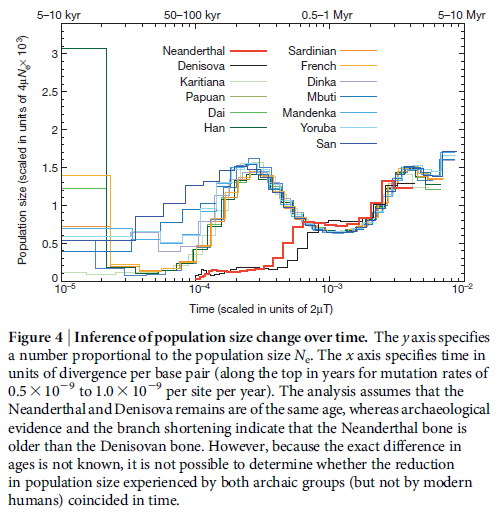 This particular item emphasizes that the differential speciation of Neanderthals and H. sapiens was in a quite advance stage already some 100 Ka ago, what does not seem too consistent with the lowest estimates for the divergence of both human species (H. sapiens have been diverging for some 200 Ka and are still perfectly inter-fertile). On the other hand the Neanderthal genetic legacy has been best preserved in genes that appear to affect keratin (affecting skin, nails and hair). 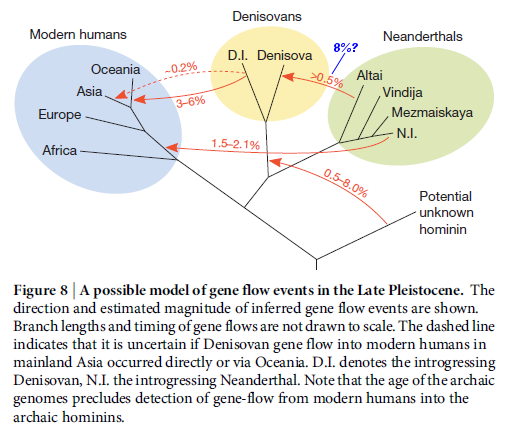 This bit I consider of particular interest because, based on the modern distribution of hair texture phenotypes, I have often speculated that straight hair may be a Neanderthal heritage and this finding seems supportive of my speculation. It’s possible that straight hair conferred some sort of advantage in some of the new areas colonized by H. sapiens, maybe providing better insulation against rain or cold (the ancestral Sapiens thinly curly hair phenotype is probably an adaption to tropical climate, allowing for a ventilated insulation of the head). Collectively, that is. The actual expressed genes are probably a quite less important proportion anyhow and the actual individual Neanderthal legacy (expressing genes and junk together) seldom is greater than 3% in any case. Or at least one of them did. 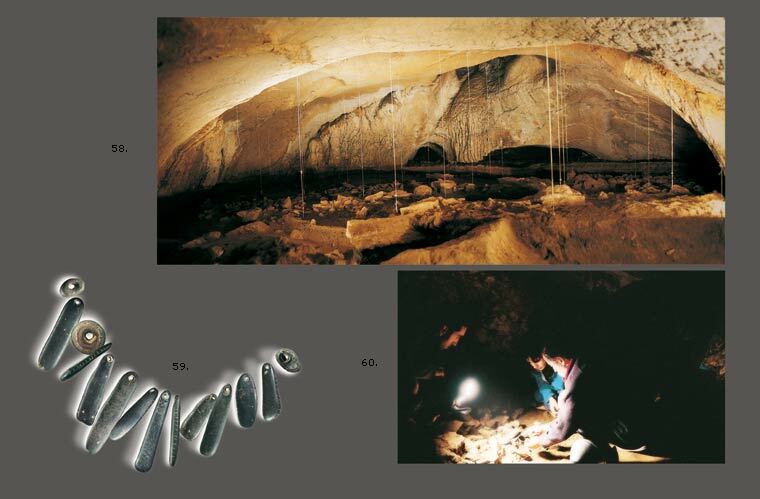 The finding is the product of detailed analysis of milk tooth formation in one infant Neanderthal from Scladina cave (Belgium) and comparison with many monkey teeth. The researchers concluded that the barium accumulation in the teeth correlates tightly with breastfeeding and gives information on this with almost a day of precision. 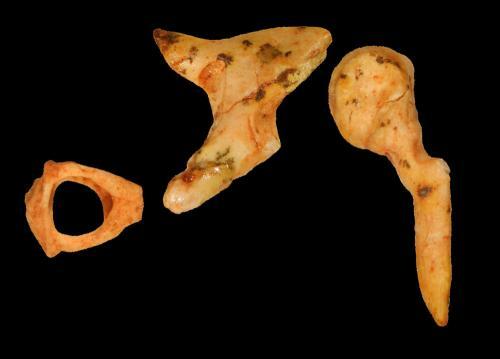 This Neanderthal kid was exclusive breastfed up to the age of nine months and then had another nine months of gradual weaning, eating also other foods, as well as its mother’s milk. This is probably much more than the average breastfeeding in our modern societies but less than it has been documented among some hunter-gatherers like Bushmen, who may well partly breastfeed their children for up to four years, what acts as (unsafe) contraceptive. Chimpanzees seem to breastfeed their infants for some 5.3 years, while non-civilized humans (H. sapiens) have ranges of around 2.4 years instead.